Deterioration due to corrosion of tubular structures during transportation and temporary storage is a huge and persistent problem in the pipeline industry. It causes direct as well as indirect material losses. Because of corrosion, time is diverted to handling complaints and customer loyalty is potentially lost. Deliveries are delayed due to reworking of corroded components. Corrosion weakens the structural integrity of a pipeline and makes it an unsafe for transporting potentially hazardous materials. Because it can appear within hours or days, a prevention method must be implemented. The increased risk of pipeline failure far outweighs the costs associated with installing, monitoring, and maintaining corrosion control systems. Preventing pipelines from deteriorating will save money, preserve the environment, and protect public safety. Therefore, planning for corrosion protection during temporary storage and transportation is a logical and above all necessary step to minimise these losses. Today modern solutions such as CorroLogic VpCI® technology are available on the market. They provide protection to equipment and parts during these sensitive time frames. 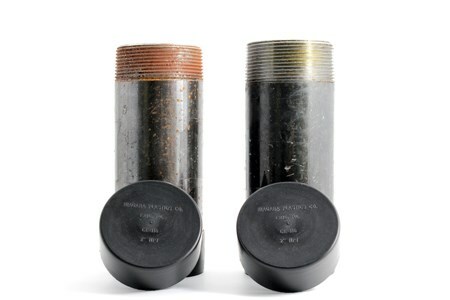 A specialised product range developed by Cortec Corp’s scientists and engineers offers solutions for preventing corrosion of pipelines and extending pipelines’ structural life: Corrologic® CorrCaps™ powered by Nano VpCI are heavy wall black polyethylene pipe caps containing proprietary Vapor phase Corrosion Inhibitors (VpCI®). By providing multi-metal corrosion protection, CorrCaps protect pipe threads, pipe ends and other tubular objects from corrosion, mechanical damage, and contamination during transit, handling, and storage. Tough and durable, CorrCaps are specially designed for easy installation and removal. They offer protection all the way to the last pipe thread. CorrCaps are available in a variety of sizes to fit any standard pipe diameter. Corrologic Tube Strips powered by Nano VpCI are also designed for protection of tubes, pipes, or conduits in storage or during shipping. Using VpCI technology, Corrologic Tube Strips make it possible to protect the interior of a tube or pipe against corrosion without expensive internal coatings. The flexible strip has a 8.5 mm (1/3 in.) diameter. It is extruded from low-density polyethylene containing a proprietary VpCI compound designed for protection of ferrous and non-ferrous metals and alloys. Tube Strips are especially effective on more expensive stainless steel and aluminium pipes. Tube Strip is placed inside the tube or pipe, which is then capped or sealed. The length of Pipe Strip should equal the length of pipe. Within hours, the vapours from the Pipe Strip saturate the enclosed air space. Even in the presence of water vapour (high humidity conditions), the VpCI vapours passivate the metal surface, thus halting the process of corrosion. Preventing temporary corrosion is an essential strategy for winning the battle against material loss due to the electrochemical and chemical deterioration of metals during manufacturing stages, transportation and transit storage. This kind of protection will ensure future losses and is of critical importance.